Beautiful 2018 remodeled Large 1 BR on 2nd floor overlooking the Canal. Beautifull, Newly Renovated (Feb 2018) 708 sq ft 1 BR condo on the canal at Sandpiper Cove in the heart of Destin. Park you car and put away the keys during your stay here. You can take the "Destin Water Taxi" and avoid the traffic to get to all the restaurants and bars on the Destin Harbor. With only a 7 min walk to the 1100ft private beach front for Sandpiper cove you will have your toes in the sand in no time. Play golf for free on our 9 hole 3 par course that winds through the 40+ acre property. With 5 pools and three hot tubs / tennis courts / shuffle board you do not even have to leave the property to stay entertained. You can take the Water Taxi to dinner to a number of Restaurants on the Destin Harbor or dine at the "Louisiana Lagniappe" right on property and watch the sunset on the Destin Harbor. 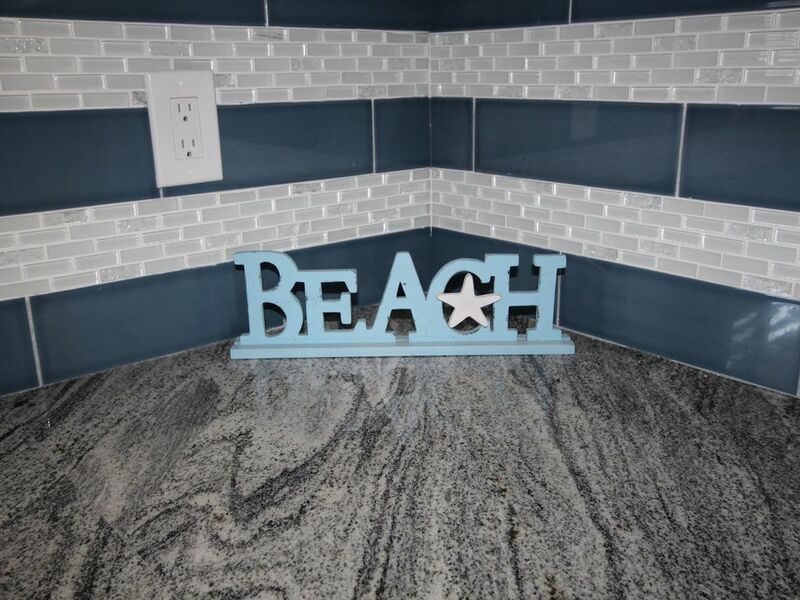 While at the beach you can grab a bite to eat at Ricks, located in the beach pavilion with bathrooms and covered shelter. Beach service is included and includes 2 chairs and 1 umbrella each day of your stay. Everything you need during your stay to cook with is in the condo and available for your use. Just bring your beach towels and bathing suits and you will be all set. Washer and Dryer is located in the condo for your convenience as well. Please also see our other VRBO listing # 1519784 which sleeps a total of 6 on the Golf Course. Local full time residents in Destin both my wife and I have our own business here. I am a local contractor focused on remodels and repairs of homes with occasionally flipping property. My wife Crystal and her business partner Jimmy run the Destin Water Taxi. We care about keeping the community strong and taking care of our beautiful beaches. We have owned in Sandpiper Cove for over 5 years and have had various properties. Unit 2051 is special to us as it is the first one we have completely gutted and remodeled and brought the quality up to where we think it should be. Living right down the road on Holiday Isle allows us to respond to any issues that may arise while you rent our unit very quickly. We want all of our guest to have a memorable trip to Destin and do our best to help make that happen. Unlike a lot of VRBO listings we own and manage this one only and try to provide the best customer service we can to our guest. When you stay in our condo you are #1 because you are the only 1. 2051 is the most recent remodeled unit in Sandpiper Cove. With finishes you would expect to see while on vacation no expense was spared to make our unit clean and comfortable. Being on the canal you are able to actually watch boaters come and go in the canal, kids fishing from the boardwalk, ducks swimming and fish jumping. Sip you coffee right from the second floor balcony and watch the sun rise. Make plans for the day to have a short 5 min walk to the beach where you can spend the day. With a restaurant and bathrooms at our private beach you only need to bring your beach towels and put your toes in the sand. If you are a Boater then bring your boat with you. Sandpiper Cove is one of the only properties in Destin offering 1,100 ft of private beach access as well as harbor access to the Destin Harbor. As a renter of unit 2051 you have the option of renting a slip in the canal right in front of your unit. Slips have water and power available for you. The Gulf of Mexico is only about a 20 min boat ride, less than 2.5 miles through the Destin Harbor which is all "Min Wake Zone" enjoy looking at homes and the beautiful harbor as you make your way to some awesome Fishing adventures. Newly remodeled bathroom with custom tile. Shower area has oversized niche to keep all your shampoos and conditioners easy to reach. We do supply 2 small bars of soap for initial arrivals and 4 rolls of toilet paper. Wash cloths and bath towels are provided. Guest should bring all other toiletries for their vacation. Sandpiper Cove has a 9 hole / 3 Par Course and you can see it from the front porch across the parking lot. Our Condo "Captains Quarters" is located right on the Canal where you can watch boats come and go. Catch fish right from the dock in the Canal. New AC system installed in 2018 with all new duct work. No issues with smell from old duct in this unit. We provide linens for both the Master bed and the queen sleeper in the living room. We also supply pillows. Our linens are high quality for your comfort. Unitized washer and dryer are in unit. This is an extremly conveinent ammentie for our guest. We do ask that you try to shake as much sand out of your suits and towels as possible prior to washing. Parking is right in front of unit but is first come first serve and there are no deginated spaces. we ask that guest only have a maximum of 2 cars during their stay. Bath towels are supplied. We will have 4 towels / 4 wash cloths and 2 hand towels in unit for your use. We do NOT supply beach towels so please pack your own beach towels to go to the beach or pools. Queen Sleeper Sofa and recliner. We have a bean bag chair as well in the living room for guest who want to just chill out. Please refrain from sitting on couches with sunscreen on due to staining. Ice and water in the door for your conveinence. Glass top stove with 4 burners. Mr Coffee maker 12 cup standard drip. All basic dishes are available for your use. Plates / bowls / silverware / plastic storage containers etc. are all available. With two chairs at the high top table and 3 chairs at the island bar we have seating for 5 people. We do try to leave some magazines in the unit for your reading pleasure. We have some cartton DVDs for the kids because we know it is sometimes hard to find something on TV that is not offensive. You will find Disney videos in the baskets below tv. 2 person Kayak is available at an additional cost. Please contact owner for details and arrangements to have access to kayak during your stay. Deck overlooking the Canal where you can watch boats come and go, fish jumping in water and ducks swimming. Multiple tennins courts for use. We have some tennis rackets and balls in unit. 9 hole 3 par course on site. This is free for our guest to use and enjoy. We have some basic clubs and balls in unit as well. 5 pools with 2 of them being heated. There are 3 hot tubs as well. All pools have bathrooms next to each one. Sandpiper Cove is a unique property in Destin Florida because in addition to having 1100 ft of private beach we also have harbor access and boat slips available for rent. With Activities and restaurants on site you might not even get back in your car once you arrive. Take the Destin Water Taxi to all the Destin HArbor Walk has to offer. The Destin Water Taxi can pick you up right on property at the Marina and take you to restaurants and bars on the Destin Harbor without having to get in the busy traffic. Target / Walgreens / Winn Dixie / Multiple restaurants all within walking distance. We try to make our guest feel like they have come to their second home in Destin. We are close by if needed and always try to cummincate any advise we can prior and during your stay from places to eat to things to do. The property was exceptional.... very comfortable and I loved the decor. We totally enjoyed our stay & are looking forward to coming back next year. The beach, shopping, restaurants, the boardwalk. Outstanding!!! Thanks Timothy, We are glad you enjoyed your vacation here with us. We hope you will consider our condo for your next vacation and we look forward to having you back again soon. Had a great time in Destin staying at the condo, will give a very honest review. It was overall a good experience but I feel a few things could be improved. When we got to the property there is a guard you have to go through to get in the gate. She could not find an email confirming our reservation and would not let us in. The owners forgot to send the email confirmation and it should have been sent right when I booked it a month earlier. Luckily I was able to get a hold of them even though they were traveling out of the country and they were able to talk to the guard and we got in. However the door access code to the condo we were given didn’t work. Again had to call the owners and they gave us a different code that worked. Now, after driving for 18 hours with no sleep this was very stressful to deal with and could have been avoided, however they did allow us an early check in which was awesome! I didn’t want to spend another minute in the car. The condo was really nice, it’s located in a huge community with many condos. Lots of older, probably retired folks this time of year and everyone was very friendly. The main bed in the bedroom was very comfortable. The pull out couch is really only suitable for small children, not really comfortable for an adult but we made it work. Could also use a few more kitchen towels. Luckily there’s a washer/dryer in the unit. Any questions I had the owners were very responsive. They also refunded my deposit quickly which is much appreciated. Would stay there again next time we are in Destin. Thank you for your honest review. Some things are simply out of our control as owners and the guards and their protocol are one of those things. We always send emails to the Guard house regarding upcoming rentals and typically they are very good about getting our renters in the system. Sorry you had to deal with this for your stay. It does actually make me feel good that they do not allow just anyone on the property that has not been approved for security reasons. Same goes with access codes. They are generated well in advance but with no way of checking them until the day of check in I always have to assume the code will work. I think I might look into a different system based on your experience for the future if I have any other problems like that. We are glad you enjoyed your stay in the condo and we look forward to you visiting us again. Thank you Samantha, we are very happy you enjoyed your stay in our condo. We look forward to having you back again in the future. Beautiful condo and convenient to shopping and restaurants ! Matt and Crystal were very accommodating and offered their help if needed at anytime. Great condo and quiet area. Relaxing on balcony and watching the ducks was nice! Very close to any shopping, beach or restaurants! Absolutely love it the condo is beautiful and the owners are extremely accommodating. Looking forward to coming back in the spring. Off Season is great here but to be able to enjoy our emerald waters and all the activities in the spring and summer can be a lot of fun as well. We look forward to having you back again. VRBO # 1519784 so check it out for availability as well. Perfect location for fun, shopping and sun! Thank you Saburina. We always enjoy you and your family coming to Sandpiper Cove and staying in our condos. For your 2 free round trip tokens please contact the Condo Owner upon arrival. Rates are subject to change until reservation has been confirmed. We have a very strict policy on capacity. The unit sleeps 4 people any exceptions to this policy needs to be approved with owner prior to arrival or additional fees and or cancelation of reservations are possible. Maximum of 2 cars for guest in 1 bedroom units. Possible short stays can be arrange even on min 7 day rentals. Please contact owner for approval of days.